The liquid level control unit is an electrical device with contacts that open and close in response to liquid levels sensed by the probes. 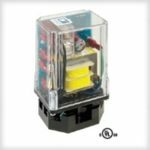 Because it is wired directly to the power source and to the sensing source, it can send signals that activate or de-activate solenoids, pumps, alarms or pressure switch devices. Warrick® controls are available in many different designs and sensitivity ratings for a wide range of application requirements. The fitting is a housing that holds the probes (or floats), insulates them from the vessel, and provides a means of connection to the control. Warrick® fittings are available for single-probe or multi-probe applications, for mounting to vessels in a variety of ways, and in open or pressure tight styles. The probe is a sensor that extends downward from the fitting, with the tip positioned precisely at the level where the control should be activated. Warrick® probes are available in a variety of materials to suit different liquids and a variety of lengths to fit different depth requirements. The liquid level control system shown here is designed for “pump up” application. 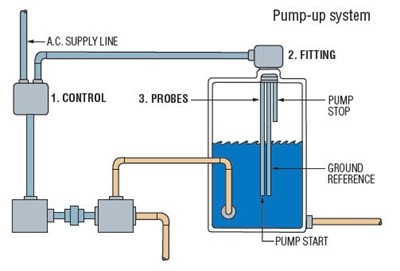 The pump will start refilling the vessel when the liquid reaches the lower probe tip, then stop refilling the vessel when the liquid reaches the higher probe tip.